The report of the National Defense Strategy Commission, “Providing for the Common Defense,” provided an excellent analysis of the National Defense Strategy(NDS) but it skipped something important: what it will all cost. That’s a shame because the commission claims “America is very near the point of strategic insolvency,” but overlooks the risk to America’s fiscal solvency caused, paradoxically, by its defenders. Recently departed Defense Secretary James Mattis, and the current Chairman of the Joint Chiefs of Staff General Joseph Dunford, advocated 3%-5% real increases to the defense budget but carefully avoided the t-word: trillion. Where does the defense budget come from? Well, Congress appropriatesthe money, but where does the money come from? Mostly, the money comes from individuals and companies, as in payroll taxes and income taxes, or from domestic and overseas lenders, via the Treasury bill (T-bill) market, which has slowed of late. The biggest foreign buyers of T-bills are Japan and China. Lately Japan has suspendedbuying T-bills because of the rising expense of hedging U.S. investments due to the strong dollar; China just stopped buying, possibly from spending foreign currency reserves to defend the weak yuan, or maybe as retaliation for Trump’s new tariffs on Chinese goods. As the current and past administrations have cut income taxes for most Americans, overseas lenders have financed much of the national debt of $21 trillion, and now hold $6.21 trillionin Treasury securities; Americans and the American government hold the rest. (The U.S. GDP is almost $21 trilliondollars.) If foreign demand for T-bills is weak, and income tax rates are being cut, the government must offer a higher interest rate to attract domestic buyers, further contributing to the budget deficit. The Commission recommended “Congress increase the base defense budget at an average rate of three to five percent above inflation through the Future Years Defense Program (FYDP) and perhaps beyond.” How much money is that? The FYDPis the Pentagon’s five-year financial plan, so let’s look at five and ten year horizons. That’s three trillion-dollar scenarios, and the fourth within a roundoff error of a trillion dollars. You can see why the commission was reluctant to Google “compound interest calculator”. And why did the commission bother to quote strategist Bernard Brodie, “Strategy wears a dollar sign,” then ignore what he said? In a way, it is understandable why the commission demurred, saying only that the strategy “is not supported by adequate investments.” They are policy guys and the conversation they sincerely want America to have about the national security strategy would be drowned out by social media comments like “Retired generals and bureaucrats demand a trillion dollars for the Pentagon!”, though avoiding the topic just cedes the field to those killjoys at OMB. America’s military is well-regarded but there is less supportamong the public for higher defense spending. The Pentagon’s argument for more money is undercut when allies like Germany – which is within range of Russian Iskander missiles– grudgingly spend 1.2% of GDP on defense, far short of the 2%of GDP that NATO members agreed to in 2014; the U.S. spends 3.6% of GDP on defense. And the Pentagon’s inability to pass a recent financial audit– that was first suggested in 1990 – further weakens its case for more money. So, if foreigners don’t buy enough Treasury securities, other lenders demand a high interest rate for their money, and the politicians don’t want to raise taxes, what do we do? President Trump has introduced a novel way to cut the defense budget: stop fighting! Pulling all troops out of Syria (Operation INHERENT RESOLVE) will save$15 billion, and the drawdown of 7,000 troops from Afghanistan (Operation FREEDOM’S SENTINEL) will save much of that effort’s $46 billion. Democrat leaders in the incoming House of Representatives also have some ideas and have signaled they want to cut the defense budget, and will demand dollar-for-dollar increases in social programs if defense spending rises. An unlikely coalition of the House Democrats and Republican deficit hawks may be who it takes to limit defense spending increases, welcome news to an American public weary of paying for a 18-year war in Afghanistan the U.S. is “not winning”, according to Secretary Mattis. 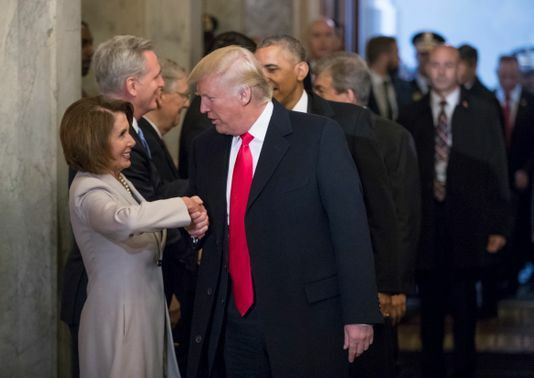 And if President Trump can work with the House Democrats and the GOP deficit hawks to restrain defense spending, he can point to cooperation across the aisle and budget savings, which may attract independent voters in the 2020 campaign. In fact, Trump’s walk-back from his recent tweet that a $716 billion defense budget was “Crazy!” to his recent request for a $750 billionbudget will be the start of a negotiation with the Democrats that gets the Pentagon close to OMB’s preferred $700 billionlevel, a number that seems “big enough” once you travel beyond the Red Line. And the recent elevation of OMB Director Mick Mulvaney to White House Chief of Staff will increase the chances the Pentagon’s budget will be reset with only inflation adjustments in the future. A flat budget will put pressure on the DoD to make changes and aggressively seek economies. For example, military personnel costs have risen steadily since 2000, “even as the number of military personnel decreased 2 percent from 2000 to 2014,” accordingto the Congressional Budget Office, which ranks personnel costs as one of the three major contributors to the increasing cost of defense. A good starting point might be merging the military’s three PX systems with the subsidized commissarysystem; a PX consolidation has been talked about since at least 1980. Or considering if we need PXs and commissaries at all, as most military bases have a Walmart or Costco nearby, and Amazon does business everywhere. We could give every soldier and sailor another hundred bucks a month in lieu of the brick and mortar benefit, then close the whole thing down. By one estimate, the U.S. has been engaged in military conflict 93%of the time between 1776 and 2015. Fighting is America’s natural state; we should be able to do two things at once. But Congress will have to do more than complain and cut the budget. To start, multi-year defense budgets would relieve contractors’ planning uncertainty and reduce the cost of weapons systems. Giving DoD authority to spend Operations and Maintenancefunds across several fiscal years will reduce budget turbulence and the “use it or lose it” mentality. Another round of military base closingswill drive infrastructure savings, and domestic content legislation(the “Buy America Act”) should be reviewed (I bet they make pretty decent anchor chain in Mexico). Instead of parroting the Pentagon’s wish for budget increase of 3%-5% above inflation to fund another round of “great power competition”, the commission missed the chance to explain how the nation’s financial challenges will affect our strategic choices, and to discuss the opportunity costs of the proposed unprecedented spending levels. The commission provided useful analysis of the deleterious effect of the inflexible Budget Control Act, but it failed to think strategically. General Omar Bradley’s observation, “Amateurs talk strategy. Professionals talk logistics.”, needs to be updated to include economics. “Money plays” so the Pentagon must give the President and Congress a plan to live within its means, rather than the default setting of “all of the above”. The Hill shares responsibility for the solution, but the effort starts on Boundary Channel Drive. James Durso (@james_durso) is the Managing Director of Corsair LLC. He was a professional staff member at the 2005 Defense Base Closure and Realignment Commission and the Commission on Wartime Contracting in Iraq and Afghanistan. Mr. Durso served as a U.S. Navy officer for 20 years and specialized in logistics and security assistance, and served a tour at the Office of the Chief of Naval Operations, General Planning and Programming Division (OP-80). His overseas military postings were in Kuwait and Saudi Arabia; he served in Iraq as a civilian transport advisor with the Coalition Provisional Authority. He served afloat as Supply Officer of the submarine USS SKATE (SSN 578).